IK Multimedia has announced the StealthPedal, the first guitar audio interface/software controller in a compact wah-style pedal, allowing users to record, play and control the included "Powered By AmpliTube" software, or any other MIDI controllable software, with the same feel and ease of use as a traditional guitar pedal. StealthPedal is an affordable USB-powered audio interface that also works as a software floor controller, allowing anyone to record guitar or bass with Mac/PC at the highest possible quality, with 24-bit A/D and D/A conversion and 44.1/48 kHz operation. Two separate inputs are provided for Hi-Z or line level instruments as well as two separate outputs, plus a convenient headphone output. The built-in expression pedal and switch can be associated with any parameter of "Powered By AmpliTube" software, or any other amp and FX modeling software with MIDI control capabilities. 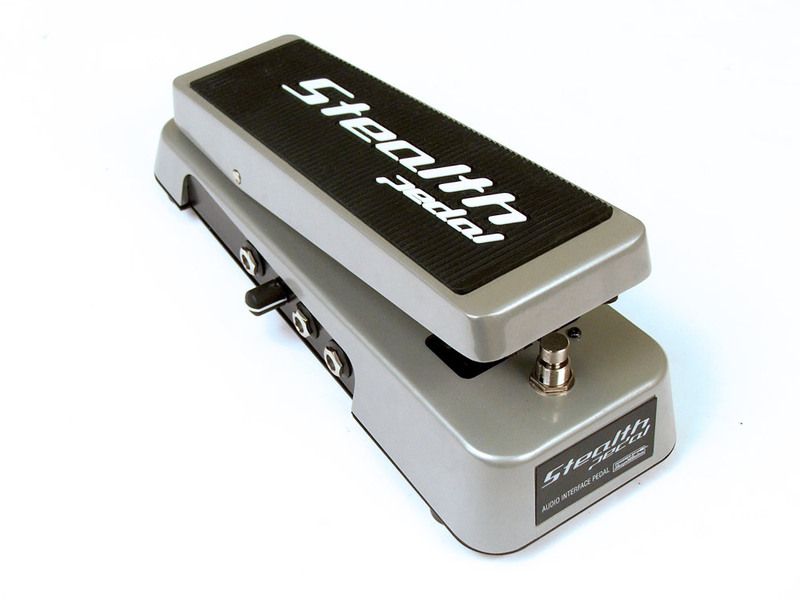 The StealthPedal controls can also be expanded with an additional expression pedal and two extra switches for building a mini-pedalboard rig with preset and single effects control capabilities for full live/recording usage. Users are not limited to controlling amp-simulator software with StealthPedal, as it can control any effects plug-in, virtual instrument or DAW with MIDI control capabilities. 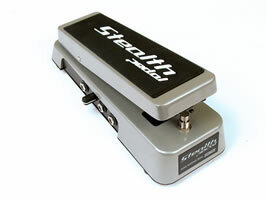 StealthPedal sports a rugged, classic-wah style, compact enclosure with a volume knob and three LED indicators that operate as a status display, tuner or level indicator when used with any "Powered by AmpliTube" software. StealthPedal's circuit design has been derived from IK's StompIO high-end stage controller, ensuring the highest fidelity in the recording of for your guitar and bass with software configurable input gain level, 109dBA low noise input stage and optimal audio quality throughout. StealthPedal also comes with a must-have assortment of software including AmpliTube 2 Live guitar and bass amp and fx modeling software, standalone and plug-in, AmpliTube X-GEAR for further expandability with all "Powered by AmpliTube" software and Sonoma Riffworks T4 for immediate recording/composing/online sharing with your Mac or PC. The StealthPedal and the included plug-in is also compatible with all popular DAW software supporting ASIO and Core Audio drivers on PC and Mac. Additionally when used with the "Powered by AmpliTube" software the system can be expanded to nearly 200 gear models including the all-time classic, exclusive sounds of Ampeg, Jimi Hendrix and the just announced Fender edition. USB powered audio interface and pedal controller. 2 balanced / unbalanced audio inputs (hi-Z or line level). 24 bit A/D and D/A conversion. Built-in expression pedal and MIDI foot-switch. Multiple LEDs can operate as Tuner or Level indicators with AmpliTube. External double switch and expression pedal inputs. Classic, rugged metal Wah-style construction. High-quality, low-noise input stage (109dBA /104dB RMS S/N ratio). Control all "Powered by AmpliTube" software/plug-ins. Control any MIDI controllable software/plug-ins. Includes AmpliTube 2 Live standalone and plug-in, AmpliTube X-GEAR and Sonoma Riffworks T4. 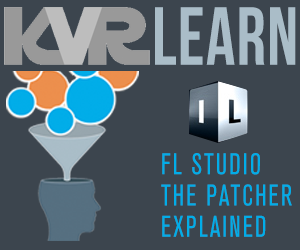 Compatible with all the most popular DAW software supporting ASIO and Core Audio drivers on PC and Mac. Endless software expandability with AmpliTube modules. StealthPedal will have an MSRP of €199.99 / $269.99 (excluding taxes) and will be available for shipping by the end of April 2009.